hello hello. thank you Grace for having me this week! I am very excited to be here. Besides introducing you to some cool artists, giving sneak peeks and before and afters of some friends homes, and sharing my favorite new product finds, I thought it would be nice to share some of the things I have learned along the way of being a . Once you finish the middle space as much as you want you are going to cut your drawing in half- scary I know- but that’s why computers are helpful. Once you have the two pieces flip them and tape your drawing back together. 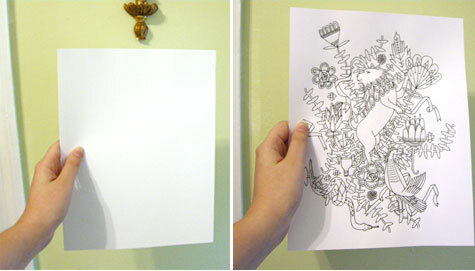 Put the tape on the back of the paper so it doesn’t obstruct your drawing at all later. Also try to tape your drawing back together as perfectly lined up as possible. It’s hard to see that I’ve even taped mine since I’ve lined it up so well. Next you are going to cut your drawing in half again the other way- (yikes!) and flip those pieces and tape them back together. Now your design should be on all the edges only and you have a big middle white space. Now fill this space with the rest of your design. Remember again- do not draw to any of the edges of the paper. Once you finish filling in all the parts you want to fill in you now have your repeatable tile. 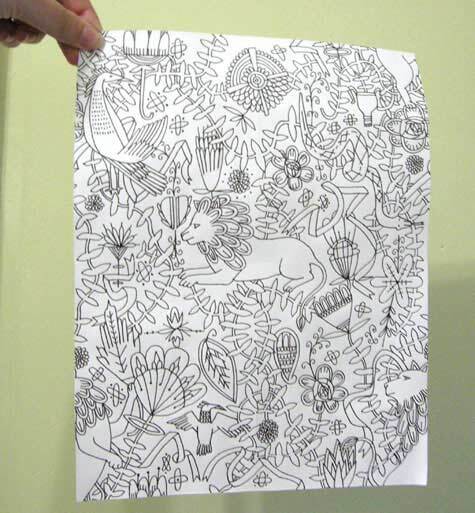 You could color this tile and then xerox it many times and line up your design- plaster it on your walls and make wallpaper. I am going to cheat and do the final coloring steps in the computer to finish up my design. I am going to scan my drawing, take it into Adobe Illustrator, color and repeat it there. Julia – something I have been dying to figure out is how you take your patterns and showcase them as applications on various products. You do a really great job with this. I’m thinking it takes photo-shopping skills far beyond my abilities! (I’m a surface pattern designer, so I understand photo-shop… to an extent!) I would LOVE to learn what tools you use to make it look so polished. ps: I also LOVE folk art! So great. Take care! Hi Julia! I’m a big fan of your work and it’s lovely to have you here at design sponge to keep us company all week! Great tutorial also! I’ve been playing with patterns for a few months now and I didn’t quite catch how it should be done until now! Your tutorial is quite simple and works great for complex designs! Thanks! that is seriously cool. great tutorial – and great illustration! wow – this is so clever, yet obvious at the same time! i’m definitely going to try it! I’m a totally self-taught artist, and since I make things up as I go along, I miss stuff. THIS post is eye-opening! I’m sure it’s “basic” to those who’ve gone to school for art, but this little tidbit has me completely excited at the possibility!!! Thank you! HI! What a educational post! Thanks for sharing! I love your example print too. This is a great tutorial! And so glad to see one of my favorite artists doing the guest blog. Thanks Julia for such an easy to follow and inspiring tutorial. Can’t wait to see how the rest of the weeks shapes up. Wow! Thank you for this post. This really was as everyone else has stated, “eye-opening” and “clever”. Thank you! How do you half pictures in photoshop and line it up? Thanks! This is so cool!! I look forward to your posts this week, Julia. Thank you for a very helpful post! This is so great Julia! I’ve taught myself how to do repeats and it has been a big struggle. I always seem to end up all confused and frustrated. This tutorial is so great and a big help! Thanks! Oh great! I’m glad to share. ae- I learned how to photoshop my applications from an online tutorial I found somewhere. I wish I still had the link. Basically it’s a mix of multiplying your layer and using the displace filter. If you search around the web you can probably find some sort of site to help you. For a non-Photoshop person, this is a god-send. *S* Thx SO much for this……. The best How-To in a long time. Much appreciated!! thank you so much………this makes it so much easier. i had struggled to do something similar in photoshop, but it was frustrating. ps. swissmiss has some helpful tutorials. This is great! Thanks so much. As a fine arts person, I have recently grown interested in pattern making and this has helped so much. i am a giant fan of yours…. how generous of you to show this technique! thanks so much!! Wow, this tutorial looks so fun to try. Thank you Julia for sharing with us. Thanks so very much for sharing! I’ve struggle with repeats- this is so very helpful. Looking forward to more of your posts this week. As for online tutorials, I’ve found Total Training and Lynda.com helpful. Absolute serendipity – I spent my day breaking my brain as I tried to teach myself to make a repeat. This is such a brilliant tutorial – i think you just changed my life! cool Julia!!!! Great pattern too! great job,! you could also scan it in and do the repeat in illustrator by using tabs which is what I used to do when I designed chilren’s clothing. These days I am lucky and my fabric company does it all for me, I haven’t done a repeat in about 15 years!! Most companies will do it for you in giftwrap, fabric etc. so although its great to know you do not have to feel intimidated into having to have your designs this way. I still think a good designer should know it anyway just to make sure the designs are well executed. This is great! I figured out my own way of doing repeats on the computer, but I always wondered how others (including Amy Butler) did this by hand. Thank you, Julia, for sharing! Can’t wait to see what else you have planned! thank you! that is SO fabulous. gotta go do this SOON. Thank you so much for these simple and easy to follow instructions. I’m self-taught “artiste” and have been experimenting with different methods of creation. I was just about to venture into pattern design and these instructions couldn’t be more timely or useful. Another big fan here, Julia. Thank you very much for this tutorial — it may be my favorite on-line tutorial ever! I’ve been wondering how to do repeat patterns for ages. Thank you! Brilliant and simple tutorial. Thank you Julia! I am a big fan of your illustration and your blog, so it’s nice to see some of the backstage tricks! julia, thank you SO much for sharing this. I make my repeats on the computer but this hand method is such an eye-opener! This is so wonderful! Thank you so much for sharing. This will open my world to patterns now. Thanks for your generosity Julia! I’ve always wondered how to do this. I often asked me about this, but never searched how to do. That is the clearest, simplest tutorial I’ve seen regarding tiling. Thanks for sharing! wow… very cool. thanks for the tutorial! I really love that lion design, and thanks for the tut! and what a beautiful pattern! Fantastic! This is a great example of how to make a pattern. A while ago I bought a more complex book on making different kinds of patterns. It’s very technical, but also interesting. It’s called Pattern Design and it’s now also available for free as a Google book. Your tutorial is definitely way easier though, thanks! I love patterning but I’ve been too intimidated by my own drawings to tile them. I’ve been toying with several approaches including this one, and seeing your beautiful lion and vine drawing has encouraged me! This is SO COOL, I can see I’m not the only one fascinated by repeats and you have given us all something wonderful to go away and try. Thanks Julia!!! joy! joy joy joy! I have long wondered how to accomplish this. You are wonderful for sharing this longed-for tutorial. and that is a GREAT pattern. Thank you, thank you for demystifying the technique of creating pattern repeats! I love your lion print! That is the coolest thing I’ve ever seen! I make repeating patterns all of the time in polymer clay, but I suddenly have all kinds of ideas for how to accomplish much more intricate, non-kaleidoscopic repeats now. Very neat! duh, that just made it all so easy. When you scan into illustrator do you then have to draw over your scan to get closed shapes to colour rather than lines, this is where I struggle but I am totally selftaught and ever learning. I’ve been wondering how to do a repeat pattern for so long, this tutorial explains it so simply! You have no idea how happy this makes me :) Thank you! I donot temember when I have seen so great tutorial. Thanks for sharing. I’m going to try it!! Julia – yup just like I thought! No idea what a displacement filter is :) but I’m definitely going to google my little heart out looking for tutorials! Thank you! Being self taught in just about everything I have done with arts and crafts, this way really mesmerizes me. I like knowing the “old” way things were done…the finished product just has so much more charm. Thank you so much, I can’t wait to try this. Now I don’t want to go to work today! well… actually i was lookin’ for some web design patterns… anyway your patters are good. Love this great tutorial! So simple too. I feel like I’ve just been given the key to a very cool secret! Thank you for sharing it around!!! I’m also a big fan of your amazing pattern. It’s great to see your behind-the scene :) very inspiring! Wow Julia, thanks! But what are the exact steps in the computer. Can you give them for the way you scanned this in Photoshop and brought over it Illustrator? How does the line in photoshop translate to vector in illustrator? and how do you color it? Also, if all of the drawing had been done only in illustrator, how do you cut the design and line it up? or do you copy and paste the whole image into the corners? How does the measurement of the repeat box get figured out? I know how to do repeats my way – but your way seems like it would save me so much time. I’m sure that everything I would have said has already been said so I’ll be brief. One word to you Miss Julia…GODDESS! this is fantastic!! i’ve been trying to figure repeated patterns out!! thank you so much for sharing!!! I swear, you’ve just advanced the craft community forward about a thousand years. I knew there was a reason why I hadn’t started doing (repeat) patterns myself yet. My subconscious must have been waiting for this tutorial! I’ve also puzzled with repeat patterns – not easy to figure out. Grazie mille! Going to try this right away! That just solved a million puzzles I had in my head for designing new gift box designs. Couldn’t have asked for a better post at a better time. Grazie mille indeed! I am really surprised at the amazing response to this post! I’m so glad I was helpful to so many people! happy pattern making! Agck!!! This is too amazingly smart! I can’t wait to try this out! Julia, you rule!!! I was amazed and delighted to find you were not only the guest blogger but also sharing a glimpse into your magical creations. Thank you! You continue to inspire me. Julia, I design fabric linings for business cases and totes. I do all my work directly in Illustrator. I’d love to do a hand drawn pattern for one of our totes soon and I’ll definitely use your method! One reader asked how you color your file once you import it into Illustrator. I’d like to ask the same. Do you use live trace, or does that alter your original design too much? What other method would you use to color your imported image in Illustrator? I’d love to know! Alma and Andrew- I do live trace my drawings. I’ve found perfect settings to get them just right. thanks! Old school, just the way I like it. I still do everything by hand. Not really by choice but because I don’t know how to use any design programs. That is wayyy too cool. Thank you ever so much for the tutorial! I will definately have to try that out. I sorta have a question, however. If I made a design, and wanted to make it into real wallpaper, what paper should I use? What paper would work in a computer printer, but wouldn’t possibly run or bleed when glueing it up? Well, when I think about it, I probally cannot wallpaper in my rental flat I’m getting in a few months… so maybe just decoupage will work on furniture and such! Still, if you had a chance to suggest paper, that would be amazing. Im a designer and Im working at my own pattern designs. So I have a question similar than Andrew ask you, but the answer it´s not jet clear to me, so please answer it again. ¿What are the exact steps in the computer.Can you give them for the way you scanned this in Photoshop and brought over it Illustrator? How does the line in photoshop translate to vector in illustrator? and how do you color it? Julia, this is a fantastic tutorial, thank you. My daughter and I tried this technique out with different patterns over the weekend, and it was successful every time. oh, this will come in handy! thank you! amazing – i love it! I am going to make one right now and see how it turns out. terrific technique….thanks! ***Do you have a “cut-paper” easy formula for figuring out a half-drop repeat??? I always go a little nuts trying to figure those out. Many thanks! Thanks so much for sharing this. I finally finished mine! I wish I knew more about computer graphics. I would love to be able to color in an image like you did! Wow perfect timing with this tutorial, thank you so much! Ok… So I tried this on my computer and it is hard! I am very new to this whole photoshop thing so I am going to keep at it. Thanks so much for the tutorial!! Julia- thank you, thank you. Wish the textile class at SVA I recently took showed us this! Love your work–I know exactly what show you went to see! That’s awesome! Thank you for sharing. But where do you go from there? I’m am new to this but have a few designs in mind and would like to be able to take them to get printed on a few yards of fabric. Can you reccommend some companies that do this? wow this is a great tutorial! thank you for demystifying the process. Thank you for sharing how to do this; It’s wonderful ! Wow this is brilliant. Repeating what others have stated – which is apropos I suppose. Can’t wait to try it. Thanks! This is wonderful!! thanks for sharing!!! talk more about decorations,fabrics, fibres, block printing,repeating pattern,drawing. THANK YOU SO MUCH!!!!! I’ve wanted to know how to do this for so long and you’ve made it super simple. Thank you I’ve always wanted to draw like this and now I can make drawing’s have improved 95%! I’m a textile design student, and I’m blown off with your trick. Now I beleive there plenty much ahead to learn, if real to be a textile designer! Thank for the super tricks. You are great!! Thank you, thank you, thank you! I have a couple of projects I have put off because I didn’t know how to do this. Are there any size specs, limited number of colors? I have designed for years in all the old fashioned methods, 2 color, four color, full color and size constraints dictated by the screen ,roller, whatever. How do you reproduce the fabric designs? Thank you so much for posting this…. it’s so much fun to produce designs that look so professional! very inspiring and useful. cheers! fantastic article. Thanks for sharing your technique! gorgeous pattern too, btw. ***Do you have a “cut-paper” easy formula for figuring out a half-drop repeat??? Draw design in middle of the page. Then cut in half vertically first. Now cut only the left strip in half again (horizontally this time to separate 1&3). Now you take piece 1 to bottom right and piece 3, to top right and stick those two quarters together again. This will leave the right hand strip (2&4) now on the left, but with a half height displacement. Stick the left & right halves together. I have made repeats for years, but never has it been illustrated so simply. Thank you for such a beautiful explanation! I feel I have been doing them wrong all this time. Thanks so much for this very easy to understand tutorial. I can’t wait to do some designs for Spoonflower! Would also love to see how you make your patterns on the computer too! This was very helpful. I suppose I can do all the “cutting and pasting” in photoshop? Please advise! I love this posting. I had to bookmark it because it is so simple and beautifully explains something that puzzles many of us. Your artwork is fantastic, thank you for sharing! You could quite easily turn this into a pattern tile in Illustrator so it could be tiled infinitely without having to step and repeat, or manually align them. You may even be able to create a fill pattern in Photoshop with your pic so you can fill anything you like with it. OMG! THIS IS SOOOO AMAZING! IT’S JUST WHAT I NEEDED. have been wondering how to do this for ages. now i’m off to cover every possible surface i can find in pattern! hmmmm…. but I’d like to know how take my drawing on Illustrator and virtually cut it and paste it together on the computer. Wish I had that ability with some magic button. Thanks for making it alot easier for me to make patterns! this is very lovely!! now i know how to create those amazing patterns, ive been searching the web for an hour for this, and finally a fruit from patience..thank you so much for wonderful tutorial julia, god speed!!! Really? That’s how it’s done? Wow, I am so excited!!! I love when the most complicated looking things turn out to be fairly simple! Thanks! It really helps a lot! I was searching for repeating pattern and start thinking to make one myself and I stumble on this page. Thank you so much. 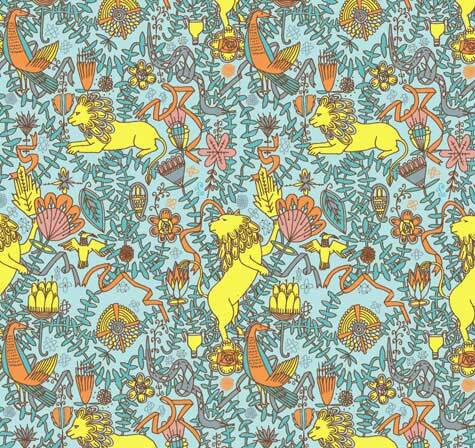 This site was God send for me as I was searching for general information on textile design. This tip was exactly what I was looking for at this time. Fantastic tutorial. I always wanted to know the “Old School” way. Absolutely superb to understand, very clear and very concise. Thanks a million from Indonesia! Thanks for sharing. I’m itching to try it out!! julia, thank you soo so much!! you have been a life saver the past few months (& few jobs) i’ve done. as a newcomer to textile design it was so difficult to find any decent tutorials about how to create a repeatable tile…yours was to the point & better yet: old school, explaining exactly how it is!! it’s just opened up a world of endless possibilities- thank you! p.s. i love your work also! Thanks for the tutorial! You took the mystery out of it! Ohhh, now it makes sense! Thank you soo much, something i’ve been dying to figure out!! As a graphic designer I’ve toyed with repeat patterns for years and always wanted to know how to do it properly, but something else always came up. Then finally got round to googling the subject and there was your tutorial. Thank you very, very much, it’s easier than I ever figured it was…awesome! This is wonderful, thank you very much. I’m learning to be a pattern designer, so this helps alot! Was just wondering though, is it supposed to match up perfectly? because both of the ones i’ve made match up, but at different heights on the page? Thanks! WOW, your patterns are SO complicated! Now I learn something new. Thank you. Thanks you really simplified what I thought was so complicated! Do you know what sizes I would need to work to to present my designs to the textile industry for fashion, interiors or gift wraps. This would be the final piece to my creative jigsaw! Cool! So much easier than the textile design class I took. Thanks for sharing. That is really cool. I adore patterns and have always been curious about how to do this. I love the low-tech way you’ve described this–paper, pencil, scissors and tape. Nice. Now I’m going to go make a pattern of my own!… Thank you! Thanks so much for explaining this so clearly. I have wondered for ages about the hidden secrets of repeats and now find that they are not so secret and hidden after all…lol. Off to try it out on some of my designs. I googled “repeating pattern” and got this tutorial. How lucky! I love Design*Droits-Humains. Thanks for having a great blog. This could be improved by filling in the white space in the middle in between the first and second cuts, so that you can have parts of the design that go over what will become the top and bottom edges. thank you so much!! I am an artist who wants to get into textile design, and I was wracking my brains about how to make a continous repeat pattern!!! Oh, thank you. I can only add my appreciation! Wonderful. Thank you so much for this. I’ve been trying to make patterns in Photoshop with no success. I can totally use these same instructions for PS. This is a godsend! The most useful tutorial ever and so hard to find this information anywhere else it seems. Design*Droits-Humains rocks! Thanks for all the continuing inspiration. to teach people like me. Thank you, thank you, thank you! This is exactly what I needed. Great pattern. I had no idea it was that easy. Thank you so much! I have been googling and googling to figure out how to do this. How simply beautiful. I owe you! I’m a high school art teacher who loves to draw. I am so grateful to have found this through a Pinterest link. Can’t wait to try it and then teach it to high school students! Thank you so much. I love your style. So elegant and such fun – my hands are itching to try it out. Thanks for the tutorial! Thank you so much for the clear instructions and illustrations. I have used the images to show my Grade 10 students how to develop very complex patterns in their design projects. Julia, great tutorial! I’m still stuck however on how to create a repeat pattern from an artwork that runs all the way to the edges of the page? Great Work. very inspiring!! What version of Adobe Illustrator so you have? Thank you. I was searching on how to create repeated patterns and nothing could be simpler than this one…. Thanks again. I’m trying to teach myself Illustrator, gaining on it slowly. One of the main things I want to do with it is scan my black and white drawings and color them in the program, like you showed in the tutorial above. Can you tell me how you do that??? Would appreciate a little lesson! Thanks. That’s the coolest thing I’ve ever seen!! I NEVER would have thought of doing it that way! This is so great! I’ve never made a repeat pattern before and this was so simple and straightforward. I spent a while online trying to find a tutorial about how to tessellate with Illustrator. This was way easier! I sure do not have the drawing skills. Well done. i gave this a try! you can see it on my blog and it came out rather fine ,i still have to perfect myself a little .. THANKS! Thank you so much for sharing this! I have never seen the process demonstrated with paper – this makes the digital process for creating repeats so much easier to understand. Step-and-repeat is one thing, but this is a whole new level! Thanks again! I’m also relieved I found this when I did. I’ve just sketched out a ton of fabric design ideas and it’ll be much, much easier to implement them now that I have seen your tutorial. Thanks for putting this here. thank you very much to teach me the repeat pattern…. Wonderful! So if I need a 24″ repeat, I should just start with a 24″ sheet of paper (or a division of 24″)? Wow, never knew how to do this! I usually just use royalty-free stock or manipulate my own image on the computer. SO trying this! Thank youuuuuu! Nice! Thanks for the great instructions. Oh I completely missed this! Thanks so so much for the tutorial Julia, I’ve been wanting to try this for so long! awesome! This is incredibly useful information for me. Thank you so much! Thanks for this lesson — I just made my first pattern this way! I’ve been looking for a post like this for ages! Thank you so much for sharing. Off to have lots of fun creating my first patterns. That’s so awesome!!! Thank you so very very much for sharing how to make a repeat pattern. I’m just starting to print my own fabric, and I can make existing patterns tileable, but I’ve been wondering how you do it when you want to start from scratch. Thanks again! I am a Spanidh designer interested in learnig about textile design. Thanks a lot for your great tutorial. I have a doubt. I used to scan my ink drawigns, but I later vectorized them in corel draw as I think scanned drawings don,t have enought quality in order to reproduce them. I think your sold patterns look as hand made ¿are them vectorized before colourin them? It is something I have lots of curiosity to learn, as I am not very goood drawing with my mouse as usin my pen. Greetings from Spain. Thank you for providing the example using exactly what I had in mind which was a complex illustration. I love your blog. Thank you so much for being so generous with your skill and talent, you have given me something to distract me from my break-up!! I thought you had to be a computer whizz to do stuff like this, now I feel really inspired! Thank ou ou very much, just what I need to solve my design dilemma,more work to do now- always good! your designs looks great and marvelous designer. Pls tell me that how do you get pattern designs in illustrator. m waiting for your reply. I just found this. Thank you so much for posting this and breaking it down so simply! Thank you so much for this. Back in 1990 or so, I created an entire line of step and repeat pattern designs based on NYC themes but totally forgot how I did it, probably because I never broke down the steps into a logical process. Your post is invaluable!!!! I really love this pattern!!! Awsome Job! Thanks for the great tutorial. I am planning on trying this out on inkscape. If it goes well I will do a tutorial. Awesome! Thank you so much, you just saved me from a headache! I really love this! something I have been trying to figure out is after you have created your patterns, how do you go about showcasing them as applications on various products? Right now I have all my patterns on printer paper done in sharpie and I know how to scan to my computer, but would love to be able to license my art for products such as wallpaper or home decor. Do you have any suggestions on where I should start?? Its nice to see good design from good experts. Can you tell me is there any way to theoretically classify textile designs or patterns. Thanks so much Julia and Design Droits-Humains, I’m working on my first repeat pattern and this REALLY helped! Thank you so much! I’m not so good at Illustrator yet, but this tutorial made me want to know more about it and make the pattern possible! I started yesterday with a theme called summer. I will try to finish it soon and post it to show how it ended. Thanks Julia for sharing this great and easy steps! ;) Greetings from Argentina. Great demo- I’m still not sure how you filled the centre portion after all the corners we’r filled. I’ve tried doing patterns in tiles, but I don’t like how they still look like squares. You don’t seem to use that method. Can you recommend a good book on this? Oh, i should have visited your blog before painstakingly do and redo my tapestry crochet design. Thank you for your generousity. Thank you, so much! It finally makes sense!!!! This is a great tutorial! I had to figure it out on my own months ago, but the pictures tell the whole story here. hey, great tutorial, we call it as a 4 cut repeat….. it would be great if you could do a tutorial on a half drop repeat the manual way….. thanks. Wonderful Tutorial…thanks a million… it’s awesome!! I just finished posting a tutorial for my online class on how to create a print repeat by hand and was looking for free software to “tile ” it into repeat on a page….. and came across your AWESOME POST HERE!!!!! Your design is so beautiful, it’s really thrilling to see your process. So Adobe Illustrator is the way to go for making it bigger, right? For now I just have to print and tape together to get the feel of it, but i’ll be thrilled to be able to color it up like you do! You’re very talented and I like the way you wrote and put this together. Thank you for the simplistic description on how to repeat a pattern. Perfect timing as a friend of mine is contemplating going into the fabric designing business. The two of us were discussing today how one repeats patterns!!! Thankyou so much.. Great job..
great tutorial and a really good design you have made! Yet another “thanks SO much for this!” comment. I learnt how to do repeat pattern by hand 20 years ago but have never repeated the exercise. I tried to figure out what to do from the old pattern, but quickly gave up and googled – landing at just the right post. this post is many many years old and julia is now a very in-demand artist, so sadly i don’t think she has time to come back for further updates, i’m sorry. my compliments!! I’ve never understood it so well as now! Very clear! Cecilia, have you checked out spoonflower.com? Search for Spoonflower. They make print-on-demand fabric, wallpaper and other stuff using your own designs. You have completely demystified this conundrum, and in such a charming way. Many thanks! This is exactly what I was looking for! Very informative! This is life changing! I have been baffled by how to do this for way too long considering how simple it is. Thank you! Thanks for sharing! I have been searching for soo lang (months) how to do this! Neven thought it was so easy! Thank you sooooooooo much Julia! Extremely helpful! How do you change your drawing to vector? I know you said to not draw to the outside edges, but what if I want to have all over color, without the white? I want to make a watercolor painting into fabric with a seamless repeat. Is this even possible? Thank you! how about to make it digonal patern? I’ve always wondered how William Morris created his repeating patterns – might he have used this technique as well? I mean, but for the copier and computer, etc. That is awesome! Thank you! Nice post. After reading the article I just remember William Blake. His sense of art was great. I think Grace Bonney has also great concept. Thank you for sharing your process, but am I the only one who is wondering where the lion in the center of your fifth image came from? It’s not the same lion shown on your original centered drawing (second image) and I’m a little baffled at how your fourth photo turned into the fifth photo (ie; all of the lines/art fitting together perfectly)…I feel like I am missing a few steps? I have gone through your article word for word trying to piece this together so that I can apply it to my own design but for the life of me can’t figure it out! Any help would be greatly appreciated, thank you! Hello! and wow! that is so simple to understand. I usually try to make it all on Adobe Illustrator and fail miserably. Plus it always end up looking too repetitive. This really takes the time to slow things down and make an original and very seamless pattern design. Thanks you Julia Rothman! Love your work! Excellent step-by-step guide…I have been wondering about this for years…Thanks!!!!! awesome guidance Thank you so much! Thank you so much! This is really helpful, and easy to understand!! Awesome tutorial! Thank you so much for sharing this! Just the clear, illustrative guide I was searching for! I’m doing my first ever fabric design with my creatures and was so puzzled on how to do a complex repeat tile like this. Excellent informative blog, simply ingenious and I may be missing something but can this be translated into drop patterns as I see you created a straight match? Thank you so much Julia! I have a stupid question: what would you use if you didn’t do the final colouring in the computer? Thanks again! That was exactly what i was looking for, thank you so much! Is there a free website where you can use an existing image to create a repeat / wallpaper design (other than spoonflower…they won’t let you save the pattern without copyright plastered all over it)? love this! thanks for this valuable info. How does one create patterns like these? What are they called in design lingo, because I’ve searched Google and can’t figure out how to phrase the question. “Diagonal patterns” is yielding me… diagonal patterns. Are there different terms for different kinds of repeated patterns? Thank you!! Please post again if you find the answers to your questions. Good on you Julia for demystifying the art with this concise demo! Oh man I’ve been trying to master this process but when I go into photoshop with my scan and try to tile them up it just won’t align. :/ no matter how careful I am to tape and the seams show which makes for sooooooo much clean up! Help! I’ll let you know how they get on! Soooo helpful! The only thing that confused me was the bit about not drawing to the edges…. All of the tips are really very handy and useful. Just going to bookmark this page and will be back again when required. This is great! I can’t wait to try. Very clear instructions, good pictures and good tips. Woow it is such a nice experiment.. Thanks for sharing with us you are such a nice tutor please! I would love to learn more about fabric and fashion designs please.. This is wonderful. It is the best and most simplified example I have seen on this topic And I Get It!!!!! Thank you. I just shared this url with my arty friends on Facebook. Fabulously informative! (And I even graduated from an Italian fashion design school where we were taught pattern repeat, j not as simply.) Thanks! Also, I absolutely love your work! Where can we see more of your designs? The learning lab is providing the best Maths and English tutor in Sydney and if you are looking for maths tutor for your child us now! How do I find places to print my design on fabric other than Spoomflower? thank you so much. what a great and easy to understand tutorial with fab art. Brilliantly simple. Why I have been doing it the hard way for so long. Thanks for sharing. A superb tutorial, thank you so much! Thank you for making this so clear and easy(seemingly) to do! I’m excited to try and make my own fabric out of one of my designs and now, at least, feel like I can do it! Hi!! I was wondering what version of illustrator to use, where to get it, and how to color a design in illustrator? Thanks! I don’t think it matters what version of illustrator you use, but in order to colour the design in illustrator, once you have scanned it in, you will first want to image trace the design. Once traced, you need to select the whole trace and go to object – live paint – make. This will then let you use the live paint bucket to fill the trace with paint. Fantastic! I never really understood how it was done. Thanks for sharing it with you. You should start your own wallpaper collection! Or is there any already? Great post and explanation, thanks! Surprisingly it seems to be very doable for all and I’m eager to learn more of these handy tips which leads to doing it! Thanks again! Does the repeat always have to be a square? Can it just be a rectangle? Thank you for your answer in advance. It can be whatever, square or rectangle. Repeats (for fabric/fashion screenprinting) typically can stretch as far across the width of the fabric as you want and are limited in height – typically 24″ or 36″ being the max. You can do any increment in-between that is divisible by 24. As in, 12″ because 2×12=24, or 8″, because 3×8=24. You get the picture. Wow, that is a fantastic tutorial. I’ve been wondering about this process and you made it so simple. Thank you! Wow, what an amazing tutorial, thank you! Wow! So many people have made this all so difficult but this has made it so easy! Can’t wait to show my year 9/10 class this next year. I’ll use the time to make some samples. Thankyou! Thank you thank you thank you! I have been trying to figure this out for so long! Thanks so much for your tutorial! Any tips on stitching them up in Illustrator? I seem to be out by millimetres which is so frustrating!! Hello, would you be so kind as to explain how I would set out my own drawings to create on standard width cotton fabric a repeat pattern using my drawings ? Would it make a difference if I used jersey as well as cotton ? Looking forward to your reply. Thank you. Thanks so much for this! I always wondered how they did this BC– before computers. Very generous and clear tutorial! Hi Suzanne. They are definitely not asking you to make something 300 pixels by 300 pixels! ****Set your dpi at the beginning, before you create your image. **** What you intend to do with your image dictates what you set the dpi at (and if you’re not sure, you may as well go for 300dpi since that leaves you the option for a high-res print later). When you create a new file in Photoshop, Illustrator, InDesign, Inkscape, GIMP etc, you will see a box where you can change the dpi number (google how to do this if you can’t find it). Like I said, you can always reduce the dpi later for other uses if you feel like it (e.g using your 300dpi image you could generate a smaller image that was 72dpi for putting on your website to make it load quicker instead of that big ole 300dpi image, and it will still look fantastic. You can do this in any program you’re using; Photoshop for example has a handy button in the menus that says ‘save for web’). I’ve definitely tried to ‘rehabilitate’ images that were 72dpi and make them higher res later on, and some of you might be in that same boat. It’s not easy and the results are so-so. Better to save yourself headaches by starting out with a canvas that is suitable for what you want to do with image later on. 2. Image dimensions — this is the other key component of your image file that you should decide at the outset. DPI is only meaningful when combined with the image’s physical dimensions (e.g. the actual size you want to print it out as). Think of it like the size of the canvas that your image is on. If you have a 300dpi file with 1″x1″ dimensions, that’s best for printing out as a teeny tiny image, like a one inch button. If you try to print that teeny image into a huge poster, it’s going to look terrible. ****Like dpi, you should set the dimensions of your image before you start drawing. *** So for example, if you intend to print something onto a standard letter size piece of paper, then set your dimensions to 8.5″x11″. You can definitely crop your image later on if you want to make it square instead of rectangle for example. And the printer you send it to will be able to adapt the file to your requested output dimensions. Just remember the same principle applies: you can make something smaller after you’ve created it without losing resolution, but if you make it bigger after the fact, you will definitely lose resolution. And again, let’s say we have two images with different dimensions: a 8.5″x11″ image, and a 1″x1″ image. If we created them with the possibility of printing in mind, we should have created them both at 300dpi. I hope this is helpful and not too confusing! Thank you for making this so much easier to understand! I’ve looked at a ton of tutorials and videos on this and haven’t had good results so far. I’m going to give this method a shot it Clip Studio Paint, which is the program I do a lot of my art in now. This is fab! Thank you for explaining it so clearly. Definitely need to give this a go. Wow! you have changed my art life forever with this. Thank you for such an easy and comprehensive tutorial. Thank you for the directions. I have done a few oil painting tessellations and I now know how to proceed. I will take a photo and cut around the perimeter to make white space. I thought I could copy and stamp, but that is beyond me. This is amazing, how beautiful works it is. I think you had to used your brain and think a lot. I love your such a creative works. thank you for sharing these. Awesome! Grace you done very well. Thank you so much for explaining this technique to make a repeat pattern. You make it more easy to design patterns. Great post. Thanks for sharing. hope you will share more pattern. Theresa, BC we had do draw in black in on paper, then cut that just like this tutorial and paste it up in the corners and draw in the middle and edges to match as you see here. 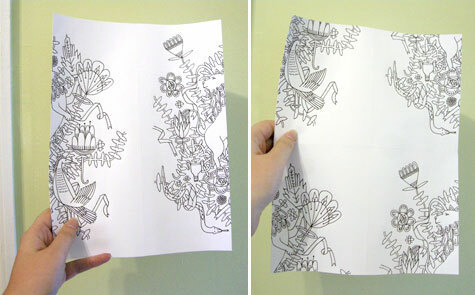 When that was done, it was put under tracing paper and the whole thing was redrawn again for first copy. If you were lucky, maybe you had a light table to trace. I think you get the picture, and clearly the process took forever. OMG! incredible. Really a great post.